The main attraction is of course the incredible landscape, but below we have started compiling some alternatives. Adrenaline Rush.A NEW tourist attraction unveiled in 2007 over 2,000 feet up a Lake District mountain in what is a first for Cumbria and England. Honister Slate Mine, at the top of Honister Pass in the Borrowdale Valley near Keswick, will officially launch its new Via Ferrata experience during the Keswick Mountain Festival of 16th and 20th May. The high-adrenaline attraction will be the only one of its kind in the country and the highest tourist attraction in England. It involves walkers taking on a newly-reopened Victorians miners route along the so-far inaccessible cliff-face of Fleetwith Pike in an activity which combines basic climbing, walking and scrambling.Users are secured to a fixed cable, equipped in headgear and then use steel ladders, solid bridges and the original miners path to reach the 2,126ft (648m) summit which commands amazing views across Buttermere, Crummock, Loweswater and the surrounding mountains, Haystacks, Great Gable, Green Gable, Scafell, Blencathra and Red Pike. Honister Slate Mine is a working slate mine which has diversified into tourism by offering a major visitor centre, café and guided underground mine tours to explain the incredible stories and hardships faced by the original Borrowdale miners who worked and lived, high on Fleetwith Pike. Mine owner Mark Weir has been working on the Via Ferrata project for years and said it was being introduced for the increasing number of people looking for a different but adrenaline-charged mountain adventure in the Lakes. Stone Circles. 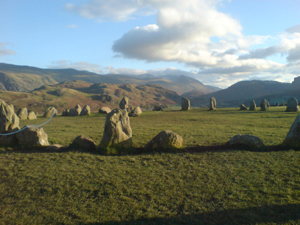 There are many remnants of stone circles in Cumbria, the most visited being Castlerigg perched above Keswick. Long Meg and Her Daughters can be found in Little Salkeld, to the East of Penrith, Cumbria, one of the largest stone circles in Britain. Nearby are Little Meg stone circle an irregular stone circle measuring approximately 5 metres across. It is one of the smallest stone circles in Cumbria. Access can be gained from the road from Little Salkeld to Glassonby. There are also beautiful stone circles hidden away to the north of Millom. In the south is the South Lakes Wild Animal Park, near Ulverston. Even though the zoo is all about animals, there are all the facilities for a full day out. 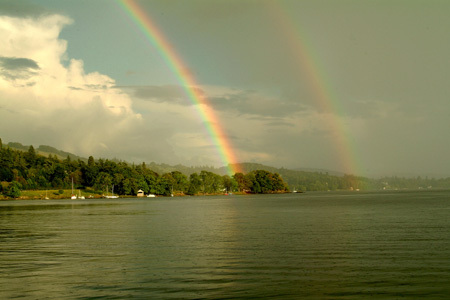 Cruises Windermere is the busiest lake for cruises and steamers, but do not forget Coniston and Ullswater. Many Lakeland churches are architectural gems too numerous to detail but our favourites include Hawkshead set above the village, Rydal and Grasmere. Kendal Parish Church is more imposing based on the boom times of the wool trade. Next door to Kendal church is the aptly named pub, the Ring of Bells. Many Lakeland churches have been blessed with the artistic skills in stained glass from the Victorian Pre-Raphelite school such as Burne-Jones and Henry Holiday. To see more of this wonderful art follow this link. The village of Cartmel, close to Grange-over-Sands, is not only home to occasional steeplechase race meetings (See our sports page) but it has at its heart the 12th century Priory church. Today, Cartmel Priory is one of the finest ecclesiastical buildings in the north of England. 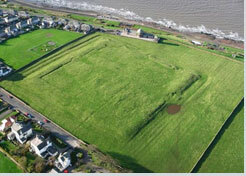 Another fascinating Priory church is that of St Bees out on the western edges of Cumbria. Honister Slate Mine You can literally enter the heart of the mountain on a fascinating guided tour to see how the miners have blasted and quarried the slate from huge underground caverns. This is well worth a visit. Being the wettest part of England Lakeland has numerous water mills, or their remains. Boot in Eskdale has a working mill as a tourist attraction in a beautiful corner of the dale. Gleaston water mill: Located close to the ruins of Gleaston Castle, the present building dates from 1774. Gardens See our gardens webpages. Worth visiting are Brougham near Penrith. Carlisle Castle has a military museum and is close to the Tullie House museum and art gallery. Kendal Castle in Kendal, Cumbria, stands to the west of the town on a natural high point and is free to explore. The current stone castle was built in the 12th century. Richard II granted the castle to the Parr family, but it is thought unlikely that Katherine Parr was actually born there. The castle is the best viewpoint for the Kendal torchlit processions and other events. Cockermouth Castle has many secrets but is private and not open to the public. One of the finest 'castles' and the oldest is of coutse Hardknott Roman fort overlooking Eskdale. There is a ruined castle at Millom but again this is on private land and part of a working farm so not normally open to visitors. Just some of the visitor attractions, not in any other of priority. Our comments are personal to try and give an honest help to visitors. Our greatest favourites are highlighted in red. 1. Sunset Leisure Centre, Silloth. Indoor fun pool, saunas and Astro Bowl ten pin bowling. Silloth otherwise is a very quiet Victorian resort that never quite took off. in this well designed and run attraction. Tel 01900 817760. Maritime Museum 1 Senhouse Street, Maryport, Cumbria, CA15 5AB. 4.Workington. Former coal and steel town. Helena Thompson Museum has historic collection of local objects. Town has a ten pin bowling centre, Reds soccer team, rugby league side and speedway track but is not a place that offers much to the holiday visitor. 5-6. Cockermouth Wordsworth's birthplace and a fascinating market town. Attractions include: The Jennings brewery does tours for visitors. Wordsworth House run by the National Trust. Nearby is historic Percyhouse Art Gallery. Cockermouth Also features tennis courts at Harris Park. Cockermouth is also home to the Malkcolm Wilson rally car workshops and team base. 7. Bassenthwaite..Armathwaite Hall equestrian centre. BHS approved riding centre near the northern shores of Bassenthwaite Lake. Nearby is Lakedistrict Animal Farm with rare breeds, birds of prey and reptiles. Play area also included in the farmyard scene. Good for kids. New Distillery visitor centre also now opened at Bassenthwaite. 8.Mirehouse. Beautiful old house and gardens sweeping down to Bassenthwaite lake. An historic stately manor house situated close to Keswick in the Northern Lake District. The house includes a fine selection of period furniture, rare letters by Wordsworth and magnificent gardens with plenty of room for the kids and adults alike. Nearby is the osprey viewing point. 9. Keswick. A bustle of shopping in an ampitheatre of surrounding Lakeland mountains. The equivalent of Windermere for the Northern Lakes. Bike hire plentiful and attractions recommended are a row on Derwentwater (takes sandwiches and lashings of ginger beer! ), the Castlerigg ancient stone circle (pictured right) and for wet days there is an indoor pool with wave machine, a cinema (the Alhambra) that is cosy and like a step back in time. There is also the Theatre by the Lake. 10. Whitehaven. Fascinating Georgian port that has revived its outlook recently. Attractions include: The Beacon Centre, Whitehaven. Set on the Georgian harbourside the centre brings to life the Cumbrian links to America, Whitehaven's Rum Story centre and the Haig Pit mine museum where giant Victorian winding engines are now turned by compressed air. Also home to Whitehaven rugby league. 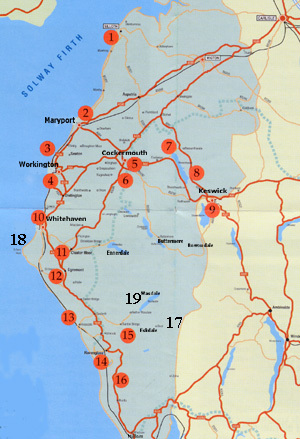 There is also a marina with facilities for seagoing yachts to explore the Irish Sea and Solway. 13. Sellafield nuclear complex . 14 Ravenglass and Eskdale miniature railway. One of the best all round attractions of West Lakeland, highly recommended by Lakestay. If you have children you must not miss this attraction! 15 Eskdale Mill. Interesting working water mill. 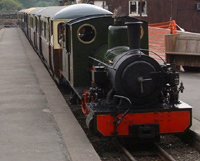 But parking is non-existent and best approached on foot...from the miniature railway. Azaleas and Rhododendrons. Around a 13th century Peel tower has grown a huge castle still home to the Pennington family. 17. Hardknott Roman Fort. A magnificent relic of the ancient Roman empire in an amazing setting on the fells above Eskdale. Free entry. The roman remains are situated alongside the lower section of Hardknott Pass (Very steep bends and not for the nervous driver!) between Eskdale and Little Langdale. Motorists approaching from Eskdale however can park at the foot of the pass and walk a mile up hill to the Roman remains. 18 St Bees Head. A wonderful clifftop walk and home to seabirds, including the elusive puffins. 19. Wasdale. Most austere and dramatic of the Lake dales...setting for the film the Devils, the mountains, including Scafell, speak for themselves. the day..." Tel: (017687) 72263 for more information. · Cockermouth Indoor Climbing Wall: Contact Allerdale Council. Workington Leisure Centre now features a Clip and Climb wall. motorboats and canoes. Qualified instructors. Licensed.